When I first moved downtown from the Whyte Avenue area, I was incredibly nervous. Resistant to the idea that downtown Edmonton—long regarded as somehow simultaneously dull and scary—could have as much excitement, adventure, and fun to offer me as Whyte Ave had, I didn’t actually want to move north at all. Luckily for me, my idea of “excitement, adventure, and fun” includes local food, community-building, and watching Edmonton grow. I soon found that as long as I could make it to the downtown City Market on a reasonably regular basis, I could feel connected to my neighbourhood. By participating in both my immediate community and the city as a wider community, by meeting the people who grow my food and make my clothes, by sharing a table while I eat my kubi burger, by dodging my neighbours’ strollers and meeting their dogs, I create connections. I make myself a part of my community. I find excitement, adventure, and fun galore. I find responsibility to my community. Fortunately, the City Market is a gem. It’s not a hidden gem, either: in December of last year, Andrew Evans, a National Geographic travel blogger, proclaimed the market to be the best farmers’ market in the world. The best farmers’ market in the world. Imagine that. The City Centre Market, 2014. Photo by Sally Scott. City Market, 2014. Photo by Sally Scott. We’ve been a city of people who love our farmers’ markets since before we became a city. In 1900, eight years after Edmonton first became a town, the Edmonton Public Market, a precursor to the City Market, opened. In 1903, the market opened in its Rice Street location at Market Square, now the site of the Stanley A. Milner library. The goods available at the market were diverse: they included everything from coal to more familiar market goods like vegetables and meat (almost certainly free-range, we can infer). As the market’s popularity grew, so did its purpose. The market expanded beyond a place of local commerce to become a local gathering place. While it was open every day of the week except for Sunday, the market was at its most bustling on Saturdays, as attendees purchased ingredients for their Sunday suppers and prepared for the week ahead. The market continued to thrive long after its inception. In 1916 the city built an all-weather structure to house the market, and in 1933 an annex was added in which six permanent stalls were housed. This success continued until the end of the 1940s. Through politically- and economically-challenging times, Edmontonians remained invested in the success of their market. An emphasis on progress and modernisation throughout the 1950s and ‘60s, though, meant hard times for the City Market. Edmonton’s focus shifted from local to international, and the idea of a quaint, “provincial” farmers’ market located so close to City Hall was seen as an embarrassment. In 1965 the market was moved from its central location on 99th Street and 102nd Avenue to a more tucked-away space on 97th Street and 102nd Avenue, near where Chinatown’s Harbin Gate currently stands. This allowed for the construction of the Stanley A. Milner library in the market’s old location, indicative of the city forgetting about their market in favour of modern structures and urban development. City Market Stall. City of Edmonton Archives, EA-10-660. In 2004, along with the dawn of locavore and slow food movements, the City Market gained new life. It reopened at a new outdoor location on the 104th Street Promenade, and is now located between Jasper and 102nd avenues. Its proximity to City Hall used to embarrass citizens; now its winter location is in City Hall. Edmonton has re-embraced farmers’ markets, and they’ve returned with a vengeance. Despite their re-emergence, I understand the temptation to favour convenient food over local. It’s an opinion I rarely like to admit, especially at cocktail parties. In an age of imports and monolithic grocery stores, it’s easy to persuade myself that if I want to eat strawberries in January, it’s perfectly reasonable to do so. All that’s available at the farmers’ market seems to be root cellar remnants (though hothouse produce is a growing trend at the market—no pun intended). Even as I visit the market in early September, produce seems to be dwindling. But the farmers’ market resurgence tells me that we’re recognizing that “seems to be dwindling” actually just means “changing”. Are the tables still filled with July’s gorgeous blackberries? Of course not; that would be weird. Instead, they’re weighed down by sturdy, cheerful pumpkins. And don’t we all get a little sturdier as the weather gets colder? The wonderful thing about making do with what’s available, while hopefully avoiding a winter bout of scurvy, is the connection that it builds. This is our land, our climate, our food. One of Edmonton’s defining features since its inception as a fur-trading post is its ethos of stick-to-itiveness and sometimes, yes, stubbornness. We gather, we commune with our neighbours, we build our community, we stick it out, and we’re proud of it. I overcome the temptation to purchase all of my food at the grocery store to attend the market on Saturdays. I buy my food for the week ahead and catch up with the goings-on of downtown Edmonton. Despite the convenience, I know that if I only ever went to the grocery store I’d find that the food wouldn’t be as good, there wouldn’t be any dogs to pet, and the cashiers would be confused when I asked how the weather was affecting the growing season. I would miss out on those connections, and I would miss out on knowing my community. I’ve used the City Market as an example of a great farmers’ market in Edmonton, but it’s one of many. We’re truly a market-loving city, and markets can be found in or close to most neighbourhoods. The wonderful thing about this is that each market is shaped by its neighbourhood and the people in it—no two are alike. It’s nice to gain a sense of ownership over your “home” market, but it’s also fun to explore markets across the city and surrounding area. The Alberta Farmers’ Market Association has an up-to-date list of local markets, and they’re all well worth checking out. Do it soon, though, as some will be packing things in for the winter before we know it! 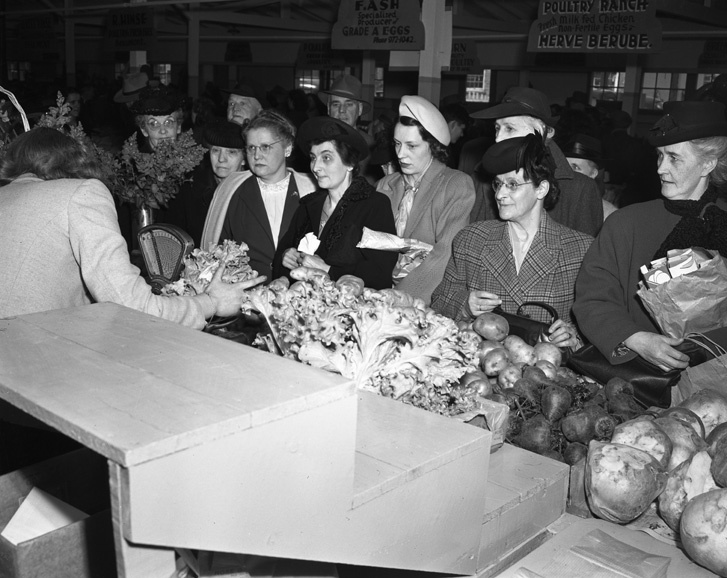 Scene at the City Market building, 1948. City of Edmonton Archives, EA-600-1024.